Learn How To Make Fishing Lures - Articles, Pictures and Videos that show you How to Make Your Own Homemade Fishing Lures. What Lures To Make And Why? I am one of those people who is very often guilty of spending time getting ready to get ready to do something rather than just getting on and doing it - waiting to have every little thing ready or until everything is perfect. In the case of making my first few lures and indeed writing this lure making blog I plan to just get on with it and figure things out as I go along. With this in mind it is very unlikely that my first few lures will . . . . .
. . . . . be perfect but trying out something for yourself is the best way to learn how to do it. 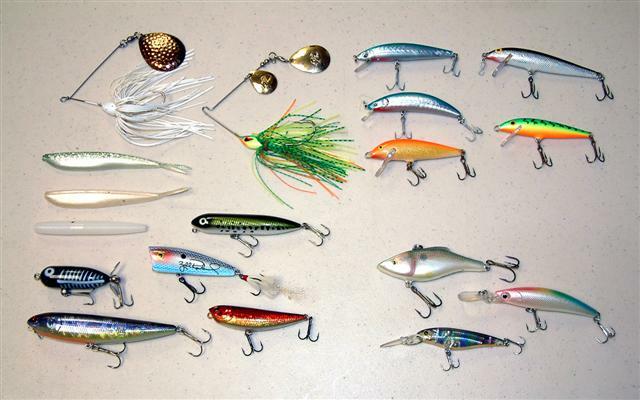 So Many Lures - Which Kind To Make? There are many many different kinds of fishing lure made from all sorts of materials and designed to catch a huge and varied range of species of fish. Deciding on which kind of lure to make first could have you scratching your head unless you have a specific lure making plan! The way I see it there are three main questions the would be lure maker needs to answer for themselves. What kind of material will be used to make the lure. What type of lure will be made from the chosen material. 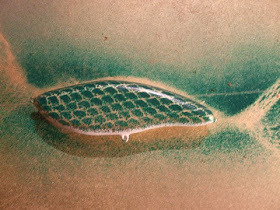 What species of fish is the lure intended to catch. Broadly speaking the first question can have one of four answers - lures are generally made from either wood, hard plastic, soft plastic or metal. Now lures can of course be made from a combination of any of these materials but usually either wood, metal or plastic will make up the main body or majority of the lure. When it came to choosing which material I would use for my first attempt at lure making the decision was a fairly easy one - as I am a carpenter by trade and offcuts of wood of many different kinds are readily available to me my first lures would be made from wood. What Kind of Lure to Make? To answer question number two above - the type of lure to be made - a jerkbait. I have three reasons for choosing to build some jerkbaits. My main reason for wanting to make some jerkbaits is that I recently read a great article in 'Pike and Predators' magazine all about how to make your own jerkbaits and could plainly see how easy they are to make - cut out a fish-like shape, round over the edges, attach hooks and some weight, sand smooth, paint and hardcoat - simple right! The second reason I'm interested in jerkbaits is that I have read up on jerkbait fishing quite a bit recently and from what I have read they would seem to be one of the most versatile and effective types of lure around today. My third reason is simple - I don't have any and would much prefer to make my own than buy some! What Species of Fish are the Lures to Catch? My Lures Will Hopefully Catch More Fish Like This One! The answer to the third question above for me is simple - the majority of my lures will be made to catch pike. I do fish for other species on occasion and will no doubt move on to making lures to catch them but I am chiefly a pike angler and most of the lures I intend to make will be for pike fishing. 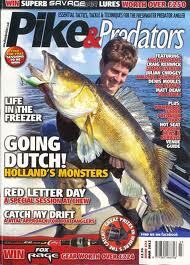 The main consideration with regard to the lures being made to catch pike would be the size of the lures. In general pike lures are larger than lures made for other more common freshwater species such as trout, perch, bass, walleye, zander, etc. Okay, with the three questions above answered it's time to plan my lure making project. I have already established that the first few lures that I'm going to make will be wooden jerkbaits made specifically for pike fishing and the way I intend to go about making them will be based on what I learned from an article that I read in Pike and Predators magazine. (Edit - since writing this post I have actually found the article online, to check it out - Click Here - well worth a read). 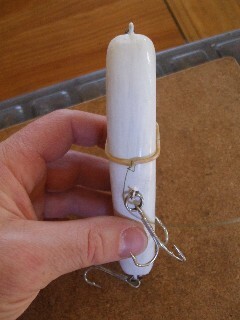 This type of lure can be made using the most basic of hand tools and does not require the use of any expensive power tools. Although the use of some power tools would speed up the lure making process I intend not to use them on this occasion as I suspect that many people who find and read this series of blog posts may not own or intend to purchase expensive power tools just for the sake of making a few lures. Lures Designed for Fishing a Specific Lake! Although I am interested in learning how to make lures as a hobby in itself I do intend to catch some fish with the lures that I make. With this in mind the plan is to make my first few lures to fish a specific venue in a specific way. The venue in question is a reasonably clear watered lake of about fifty acres in size. It contains pike and perch and nothing else. I have had some good catches of pike from this venue with bait fishing tactics but never really tried lures here. From my experience on this lake I know that the pike are very active at dawn and dusk mostly in a fairly shallow bay in the north-east corner of the lake. They then move off to deeper water for the middle part of the day. My first approach to lure fishing this lake will be to work shallow working lures in the north-east corner of the lake for the first few hours of the day and then move out to deeper water with sinking/suspending lures for the middle part of the day and then back to the shallows for the last few hours of daylight. The lures will all be perch pattern as I am a great believer in giving the fish what they are used to seeing - this approach has worked well for me in the past. So what of the lures then? 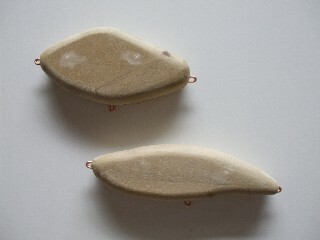 I plan to make four flat sided jerkbaits in two different body shapes. 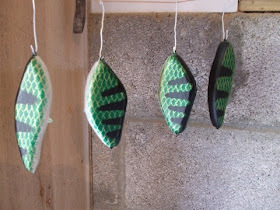 One of each shape will be a floating jerkbait designed to fish just under the surface and the other two will be weighted to make them sinking/suspending jerkbaits which I will hopefully be able to count down and fish at any depth required. 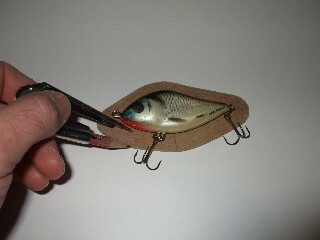 Well that's the lure making plan, looks good on paper, let's see how it pans out. You could derive a template from a lure that you already own by tracing around it somehow or copying it's shape in some other way. You could also probably copy a lure by printing out a picture of it from the internet or cutting one out of a magazine. You could use a template from someone who has already built a successful lure. There are a few available on the internet but they are not that easy to find. You could buy a lure making book or eBook which usually have lure templates in them. You could design your own fishing lure template. There are probably two ways to go about this - you could either copy mother nature by making your template resemble as closely as possible the prey fish of your target species or you could try to come up with something new and different. Either way this method will be very much trial and error! 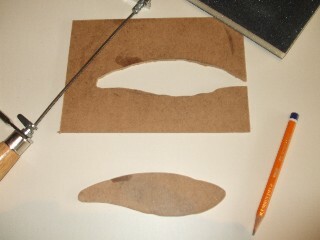 For the templates for this lure making project I tried two of the methods above. For one of the templates I wanted to copy a small salmo slider jerkbait that I have. This lure has a lovely side to side action which I'd like to copy. The lure I have is too small being about two and a half inches long. 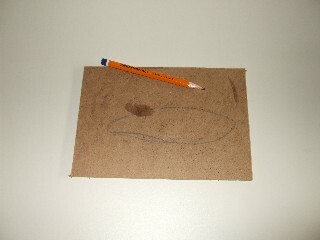 For my template I intend to scale this up to around four inches or so - a more worthwhile target for a larger pike. For my other template I intend to try designing a glider type jerkbait. I want the shape of the lure to closely resemble the shape of most of the prey fish in my local waters. 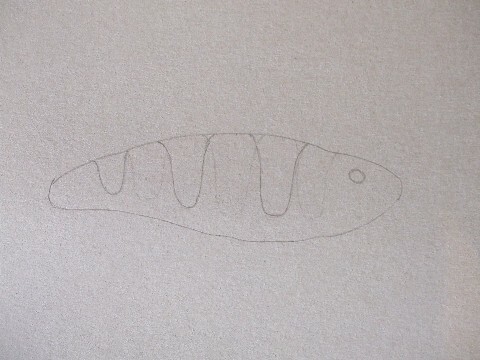 First I drew my 'fishy' shapes onto some hardboard using a pencil. 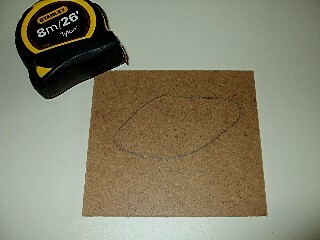 I figured that hardboard being thicker and stronger than cardboard would be a better material for making the lure templates. In hindsight it was not necessary to use hardboard at all - ordinary cereal box cardboard would have done just fine and would have had the advantage of being much easier and quicker to cut out! 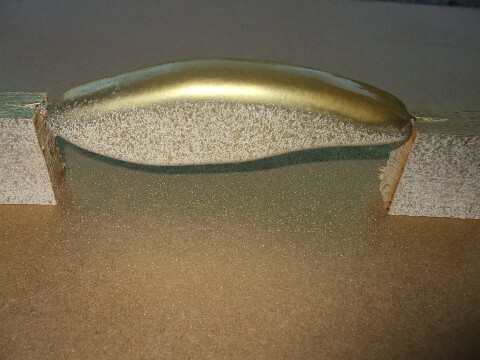 This Shape is a Copy of a Salmo Slider Lure (see above). 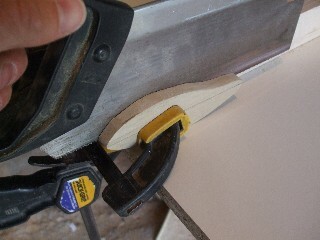 Then I clamped the hardboard to the edge of a bench and cut out the shapes using a coping saw. 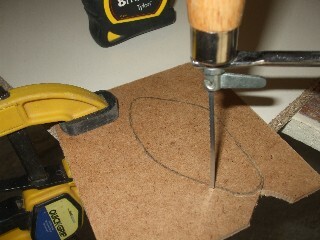 If you are using cardboard for your templates this step is very easy - you would simply cut them out using a scissors. 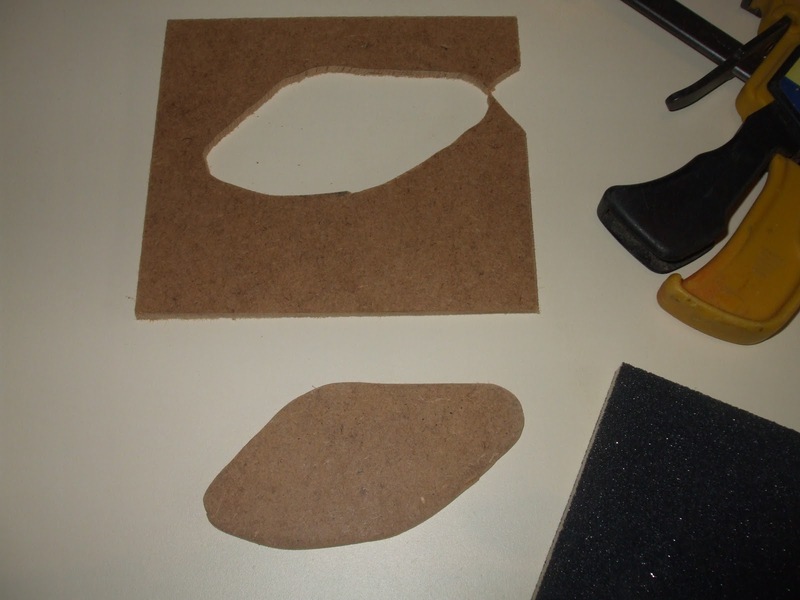 After cutting out the shapes with the coping saw I used some fine sandpaper to smooth over the edges of the templates - not really necessary but just being fussy! 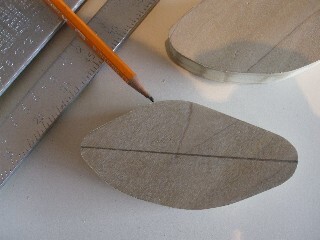 Now that I have some templates it's time to mark out the wooden lure blanks and crack on with making my lures. 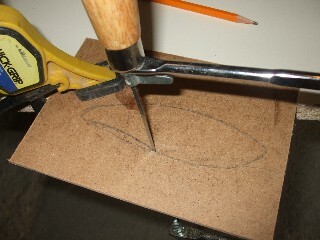 The first step I took was to place my lure templates onto a piece of wood and trace around them to give me the outline of the lure - this is the line I would be cutting to. In this case I'm using 22mm thick poplar for my lures for no reason other than that I have lots of scraps of the stuff lying around my workshop. I have not seen anyone else use or mention poplar as a lure making material but it has similar properties to pine in that it is light and easy to work with so it should be ok. Poplar may turn out to be a useless wood for lure making but I feel that the trial and error method of learning how to do something is probably the best way to learn. The next step is to go ahead and cut out the lure body. I did this using a coping saw by clamping the wood to the edge of a workbench with a quick-grip clamp and moving the position of the clamp periodically as necessary while cutting to the pencil line on the wood blank. 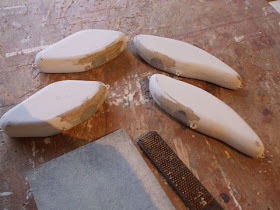 After I cut out the lure bodies in this manner I noticed that the edges of the lure blanks were quite rough and required some sanding to smooth them off a little. I did not get too carried away with this initial sanding as the lures will get a proper sanding at a later stage. At this stage if I were using screw eyes for the line tie and hook eyes of the lures I would get on with rounding over the edges of the lure blanks, but since I am using the through wire construction method for these lures I feel that it will be easier to mark out and cut the slot for the through wire now while the edges are still square. The first thing I did to mark out for the through wire position was to lay the lure blank on its side and put a small mark at the nose and at the tail of the lure. These marks represented the locations on the lure where I wanted the line tie and tail hook eye to be positioned on the finished lure. 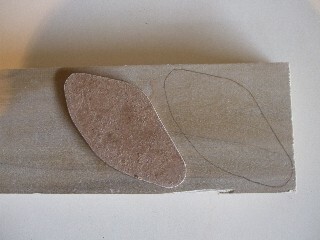 I then marked a straight line along the side of the lure blank joining these two marks. This line represents the position of the through wire within the lure going from nose to tail. 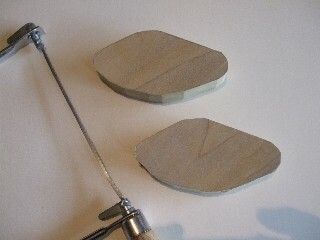 I then used an adjustable square as a marking gauge to mark a centre line down along the belly of each lure. 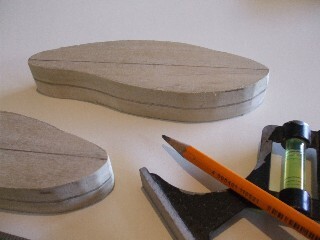 The lure blanks now have two lines marked onto them, a centre line along the belly which is the line which must be cut to for the through wire slot and a line along the side which represents the depth to which the through wire slot must be cut. I used a dovetail saw (any type of hand saw would do really) to cut along the belly line on the lure to create the through wire slot. I did this by clamping a sturdy piece of wood to a workbench and then clamping the lure blank to this piece of wood to hold it while it was being cut. At this stage I had intended to use a rasp and file to round over the edges of the lures so I could show you how to do this by hand, however a combination of laziness, lack of time and the fact that I had a router set up in the workshop with a rounding over bit in use on another project led to the lure blanks getting their edges rounded off using the router. 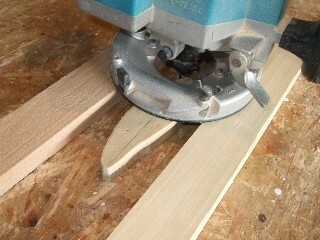 Using a router on a small piece of wood such as a lure blank can be tricky. 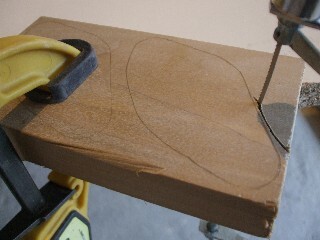 What I did was nail the lure blanks to my workbench using some fine wire panel pins to stop them from moving around during the routing process and used two pieces of wood the same thickness as the lure blanks positioned either side of the lure blanks to support the router and prevent it from wobbling. After doing the first side of each blank I prised them off the workbench, removed the panel pins, turned them over and nailed them back onto the work bench making sure to nail through the same holes to minimise damage to the lure blank. 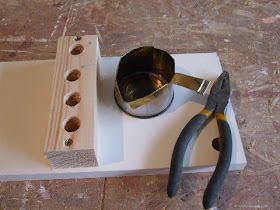 The tiny holes left by the fine wire panel pins can easily be filled later. 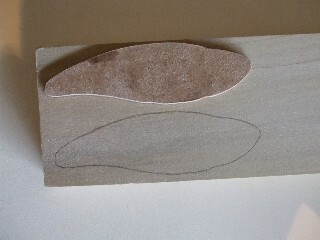 The next step after the lures edges have been rounded is to use some wood filler to fill any holes, dents or rough edges on the lure blank prior to sanding. 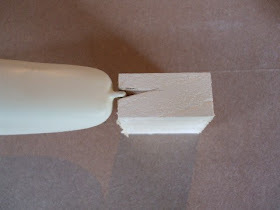 I left the filler to dry overnight before sanding the lure blanks starting with a coarse grit sandpaper then a medium grit and finishing with a fine grit sanding pad. Some areas on the lure blanks needed a second round of filler as the first layer of filler shrunk down slightly as it dried out. At this stage the lure blanks are actually starting to look like some lures. The next step will be to make some through wires and fix them to the lures. Making and fitting a throughwire to a homemade lure is a fairly simple task, certainly one of the easier tasks involved with making your own lures. There are many different kinds of wire commercially available from fishing tackle outlets and other sources (such as your local DIY and hardware store) which are suitable for making throughwires for lures. One of the themes of this lure making project so far has been not to buy anything for the lures unless absolutely necessary - making the throughwires for the lures will follow the same idea. So where can we find wire that is suitable for making lure throughwires just lying around the house? One place to look for some wire is to locate any old and broken electrical appliance that may be in the house and cut the chord off it. If the copper wires inside the chord are of the single core type rather than the multi strand type then it should be fine for your lures. I found a short length of electrical cable rolled up on a shelf in the garage which had more than enough wire in it to make the throughwires for my four lures. The picture above shows one of the pieces of electrical cable that I used to obtain some wire for my throughwires. 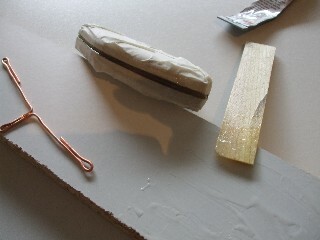 I removed the plastic coating from around the copper wire by cutting along it's length using a sharp utility knife. 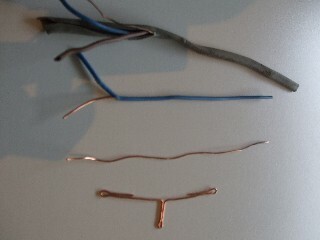 Making a throughwire from copper wire is quite easy as copper wire is reasonably soft and easy to bend by hand. 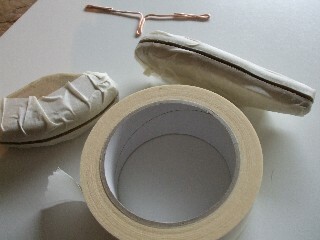 The use of a pliers however will make she shaping and bending of the wire much easier. 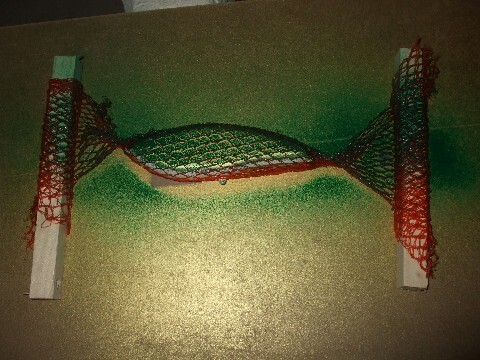 The size and shape of the throughwire was determined by referring back to the lure template. 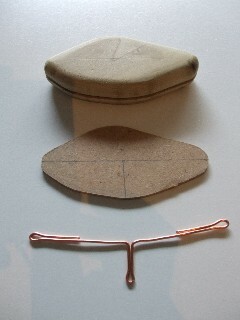 The positions of the hook eyes and line tie are marked onto the template and lines are drawn onto the template to represent the position of the throughwire within the lure. 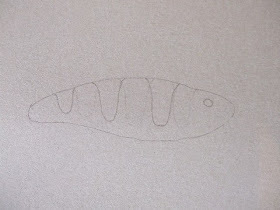 These lines create a 'T' shape as shown in the photo below which gives you the actual size and shape of the throughwire for the lure. The wire is then bent into this 'T' shape making sure that the loops formed in the ends of the throughwire stick out from the body of the lure enough to allow the fitting of split rings and hooks later on. At this stage I'm almost ready to go ahead and fit the throughwires into the lure bodies. First however we need to check that each throughwire fits snugly into each lure body and that the hook eyes and line tie are sitting in the correct positions. At this point I realised that I had made my first mistake - the slots that I had cut into the lure bodies using a tennon saw were not nearly wide enough to allow the throughwires to slide into them. To be fair the copper wire that I used to make the throughwires was probably a little on the heavy side (too thick) for the job and a thinner wire would have fitted into the already cut slots neatly. 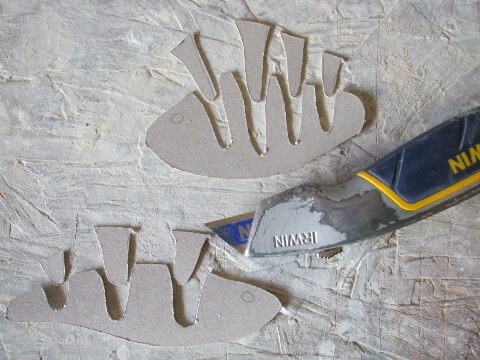 I had to widen the throughwire slots on each lure using a padsaw which has a wider blade than the tennon saw (commonly used for making cutouts in drywall) as shown below. After the throughwire slots on each lure were widened the throughwires themselves were offered into each lure to check that they were sitting correctly and minor adjustments were made where necessary. Once I was happy that the throughwire for each lure was sitting correctly I was ready to glue them into the lures. Before mixing up some epoxy to glue in the throughwires I put some masking tape around the slots on each lure as the process of putting the epoxy down into the lure bodies was going to be a bit on the messy side. 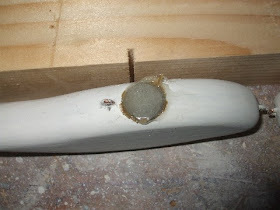 I mixed up some five minute epoxy on a clean scrap of wood using a thin piece of wood and then used this piece of wood to push some epoxy down into the slot in each lure. I then pushed the throughwire down into the slot making sure that it had bedded into the epoxy fully. I then put a generous amount of epoxy around each of the hook eyes and line tie to make sure that they would stay well secured. As soon as I had the throughwires pushed down into the lure bodies and glued in I removed the masking tape from around the throughwire slots before the epoxy went off so as to avoid it getting glued to the lures. I left the epoxy to go off for about twenty minutes or so and returned to fill the throughwire slots on each lure with wood filler making sure to apply extra filler to allow for shrinkage as it dries out. With all the throughwire slots filled with wood filler the throughwire fitting process is complete. 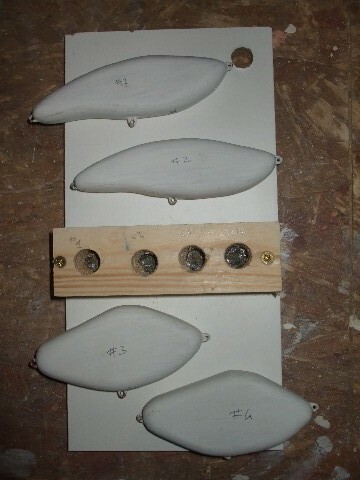 The next step will be to properly sand and seal the lures prior to balancing them. Now that the throughwires have been fitted to my lures and all the filler has been sanded flush it's time to seal an balance the lures before finally painting them and getting out and doing some fishing with them. So what does it mean to balance a lure exactly? Balancing a lure is the process by which weight is added to the lure (internally) to make it sit in the water in a specific way to give it the action we require. For example the amount and positioning of the weight that is added to a lure will determine whether the lure floats, sinks or suspends and also whether it sits in the water horizontally, nose up or nose down. For my four lures I plan to make two of them slow sinkers which rest in a nose down position and the other two floaters which sit horizontally in a slightly nose down position. What I hope to achieve is two sinking jerkbaits for deeper water that work in an up-down as well as side to side action (if this is possible) as I jerk them back in and two floaters that will work with a side to side action one to two feet from the water's surface. I have not really done any research into jerkbait design or balancing and since these are my first homemade lures it is quite possible that the lures I'm making will have a totally different action to that which I'm trying to achieve! 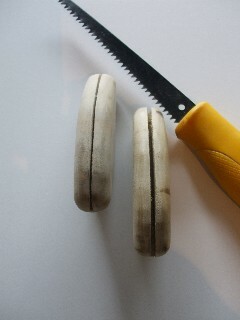 The process of balancing a lure obviously requires that it is put into water, so before I can proceed the lures need to be sealed so as to prevent the wood blanks from soaking up water. There are many different products that can be used to do this. I would opt for a polyurethane type varnish or an oil based wood primer as both tend to repel water quite well in my experience. In this case I used some white wood primer as I had a small amount left over in a tin on a shelf in the garage. I used a brush to apply the primer but would have dipped the lures instead if I had had enough of the primer to do so. 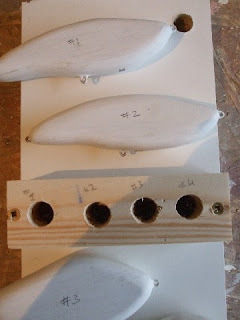 I applied two coats of primer allowing 24 hrs between coats and sanding the lures thoroughly before each coat was applied. 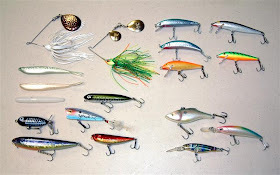 To balance the lures I am going to need a container of water, some hooks, split rings, an assortment of lead weights and some method of attaching the weights temporarily to the lures. I took the hooks and split rings off a similar sized lure I have that I don't use much. I'll need to do some research to find out what the best hooks for these type of jerkbaits would be but for now I'll just use what I already have. The first thing I did was attach split rings, hooks and a large cross-lok link to the lures and drop them in some water to see how they would sit without any weighting. 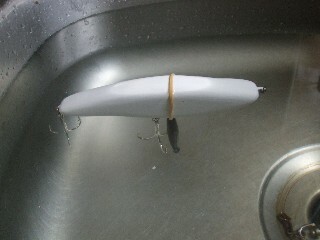 The picture below shows one of the lures floating in my kitchen sink (just about deep enough for balancing surface lures) before any weighting is added to it. As you can see the lure is sitting slightly 'nose up' and keeled over to one side a little. The lure in the picture above obviously needs some weight added to it, in this case I want it to sit horizontally in the water, slightly nose down and with the back of the lure only just proud of the waters surface. Adding some weight a little at a time and changing the hanging position of the weights on a trial and error basis resulted in the balanced lure shown in the picture below - perfect! Attaching the weights for balancing is quite easy. I simply tied a short piece of fishing line onto a suitably sized elastic band, put the elastic band on over the lure and slid different sized drilled weights onto the line keeping them in position with a small split shot. 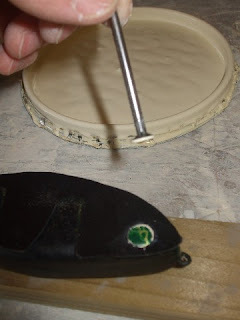 When the right combination/amount of weight was achieved the position of the line was marked onto the lure as this would be the position for the hole to be drilled into the lure to accommodate the lead. 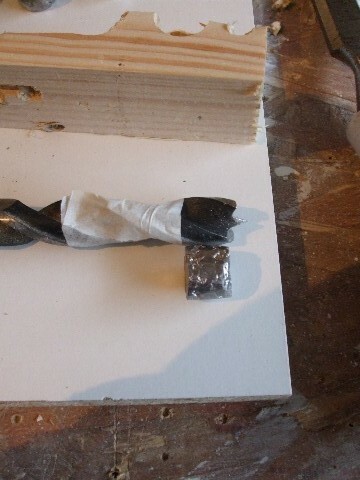 The lead and lure were then left aside together ready for drilling out and weighting. 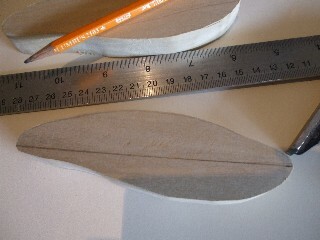 There are two ways as far as I can see to go about fitting internal weighting to wooden lures. 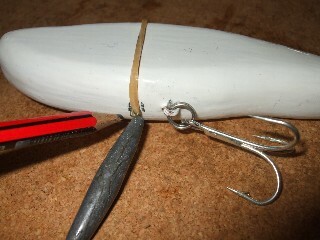 One way is to drill a hole at the required position in the lure body and simply melt and pour the lead into it. The other way is to mould the lead into a dowel or pellet and fit this dowel into a hole drilled into the lure body. The first method of simply melting and pouring the lead into a hole in the lure body would involve less work but you would really need to know the correct diameter and depth of the hole required before drilling any holes in the lure blanks. 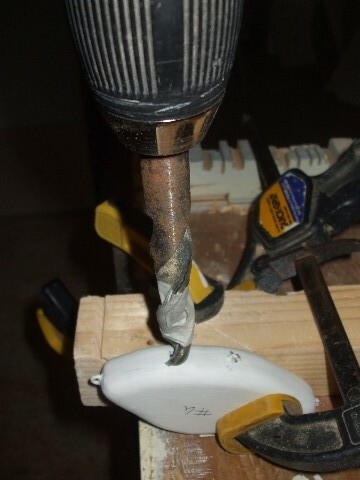 As I had not done this before I did not want to risk drilling a hole in the lure body that would be the wrong size and potentially ruin the lure! I decided to mould the lead for each lure into an individual cylinder shaped pellet of 18mm diameter and then measure the length of each pellet which would give me the depth of the hole required in each lure. As the old saying goes "a picture say's a thousand words". 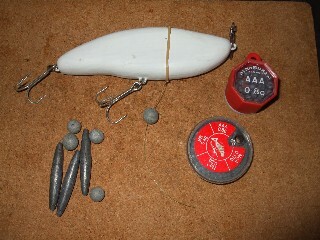 The sequence of pictures below show how I made the lead pellets and then fitted them to the lures. The first step was to make a mould of sorts for the pellets. 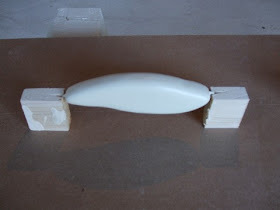 I did this by drilling 18mm diameter holes through a scrap of wood and then screwing this onto another scrap of wood which would be the base of the mould. I then made sure to number each of the lure blanks and mark the corresponding number onto the holes in the pellet mould so as not to get confused as to which lead went into which lure. 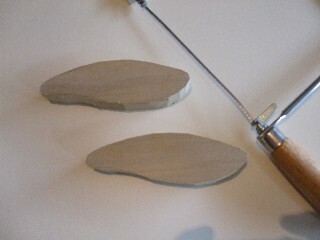 Now that I had a mould ready to make the lead pellets for the lures I needed some way to melt and pour the lead. There are of course great tools commercially available specifically for melting and pouring lead for lure making and other hobbies. The theme of this lure making project so far however has been to use stuff that I already have so buying a new tool for this was out of the question. I had to put on my thinking cap for a while but eventually came up with a simple solution. I made a very crude but simple melting pot out of an ordinary everyday tin can. 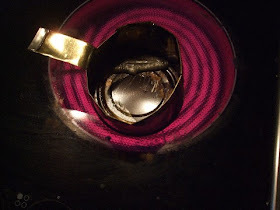 I put the lead into my new melting pot, placed it onto one of the rings (at full heat) of the hob in my kitchen, waited a minute or so for the lead to melt and then poured it into my pellet mould - simple! A word of caution here - during the process of melting lead some rather nasty and toxic gasses are released into the air. Now for the very small amounts of lead we are working with here this is not a problem, just make sure the area you are working in is reasonably well ventilated and avoid holding your head directly over or above the melting pot while the lead is melting. 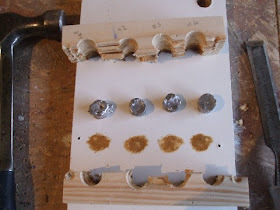 After the lead for the four pellets was poured into the different holes in the mould I then removed the base of the mould and used a hammer and chisel to split the wood which formed the main body of the mould and then removed the pellets. 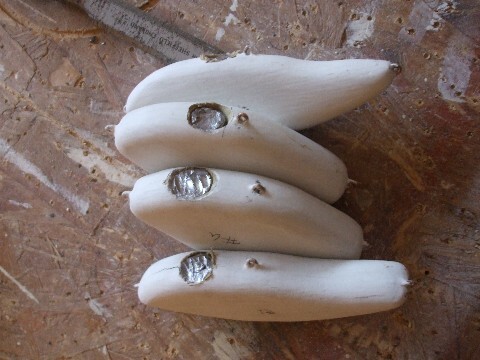 It was now time to drill holes in the lure blanks to accept the lead pellets. Each of the pellets was a different length and so required holes of different depth to be drilled. 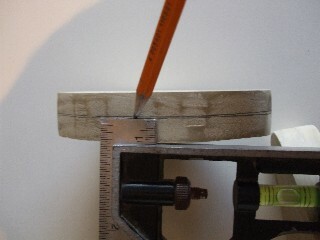 Prior to drilling each hole I marked the length of each pellet off against the 18mm diameter drill bit using masking tape and then drilled a hole to the depth of this mark on the corresponding lure. I drilled the holes about 2mm-3mm deeper than the length of the pellets to allow for glue and filler. 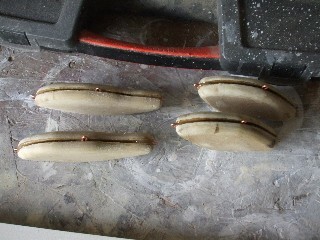 With the holes for the lead pellets all drilled out I was now ready to go ahead and fit the pellets into each lure. At this point I realised that I had made another mistake - the 18mm diameter pellets would not easily go into the 18mm diameter holes in the lure blanks. I really should have made the pellets 2mm smaller in diameter than the holes that were drilled in the lure blanks - lesson learned! I solved this problem by taking my hammer and tapping on the sides of the pellets which both smoothed the sides of the pellets a little and also reduced their diameter a little. I still needed to use a hammer to tap the pellets into the lure blanks - not very clever - but it got the job done. 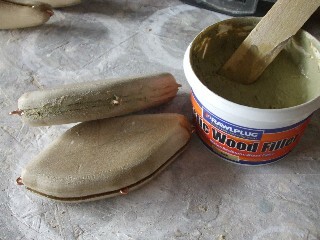 Prior to fitting the lead pellets into the lure blanks I dabbed a little five minute epoxy into the holes in each lure. After the pellets were hammered into the lures I then filled the holes with a generous amount of five minute epoxy to ensure that they would stay put for good. When the epoxy had fully hardened I filed and sanded down the belly area of the lures so that they were now ready for undercoat and painting. This is where the lure making project gets interesting. I could realistically paint my lures just about any colour under the sun. 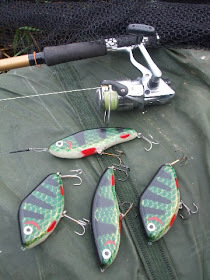 However if you have read what I wrote earlier in this post about my lure making plan you will know that I intend to paint all of my lures in perch pattern to target the pike in a particular lake where perch are the only prey fish of the pike who live there. There are a few different ways to paint lures - hand painting, dipping, spraying with an airbrushing kit or similar or spraying with aerosol spray paints. For this project I'll be using a combination of dipping, hand painting and aerosol spray painting. 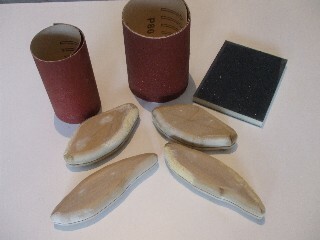 Prior to doing any painting the lure blanks were sanded thoroughly with a very fine grit sandpaper to make them as smooth as possible. 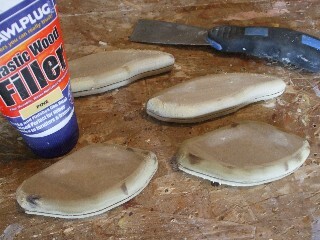 Once they were sanded properly the first step was to dip them in an oil based undercoat. I used a cream white coloured undercoat that I had left over from some cabinets I had been working on. 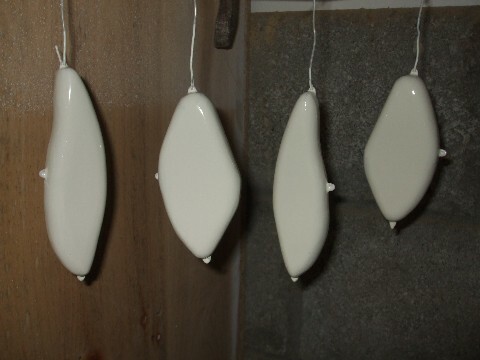 I put up a short string line in the workshop between the end of a shelving unit and a wall and made some little light wire hanging hooks to use for hanging the lures up to dry between coats of paint. 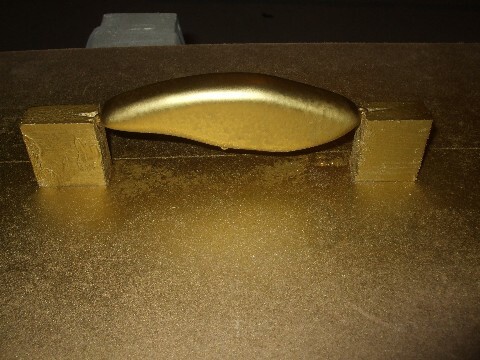 After the two coats of undercoat it was time to spray on (using aerosols) the base colour of the lures which in this case was going to be gold. 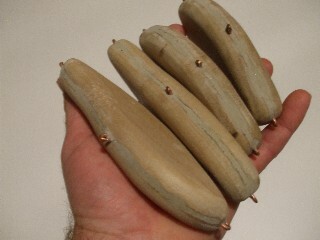 I cut some little blocks of wood and made small notches in them to use as props for the lures - see picture below. This way I could spray the top and both sides of the lures in one go. The Backs of the Lures were Sprayed First . . .
With the gold base coat completed it was then time to add the green body colour in a scale pattern. I used a simple mesh bag, the kind that you get from the supermarket with vegetables or fruit in them. I wrapped the mesh around each of the lures and stretched it out until I was happy with the size and shape of the pattern. I then sprayed the green paint rather sparingly over the lures building up the colour in three coats making sure not to move the lure or mesh between coats. The aerosol spray paints that I used were great because they dried very quickly - I only needed to wait 30 seconds or so between coats as long as I did not spray the paint on too heavily. 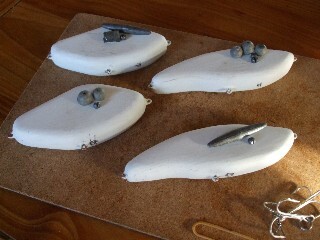 The lures were now coming along nicely - white belly, gold base colour and green scales. 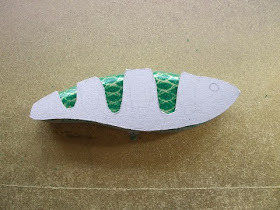 The next step to creating a perch pattern was to add the black stripes. For this I was going to need to make some stencils for the pattern. 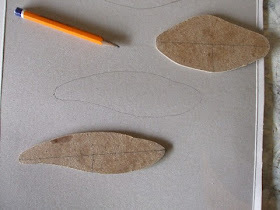 I used my lure making templates to trace the outline of my lures onto some cardboard and then drew the stripes onto them and cut them out using a utility knife - see the pictures below. The Required Pattern Was Drawn onto the Stencil . . . 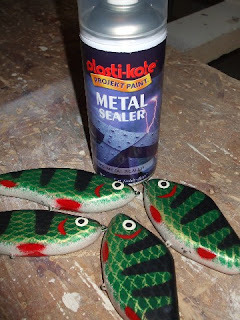 I placed the stencils onto the sides of the lures in turn and sprayed the backs and sides of them black, again ensuring to build up the colour slowly by spraying on a number of light coats rather than doing it all in one go which would run the risk of the paint pooling or running on the lure. With the black stripes now painted onto the lures all that was left to do was add some red fins, a gill cover and the eyes. I made another stencil for the fins and gill cover and then sprayed the fin and gill pattern onto the lures. To add the eyes I cut a hole in the stencil that I used for painting the stripes and used this as a guide in order to get the position of the eyes in same place on either side of the lure. 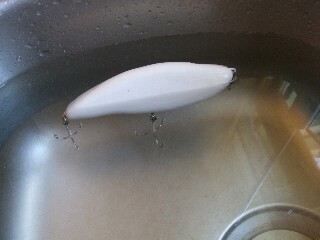 I simply dipped the head of a large nail into some white paint and dabbed it onto the lure using the stencil as a guide. To put the black dot in the centre of the eye I just used a smaller nail with a smaller head in the same way but with black paint this time of course. 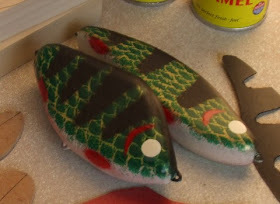 Now that the lures are fully painted there is only one step left before they are ready for testing and some fishing. 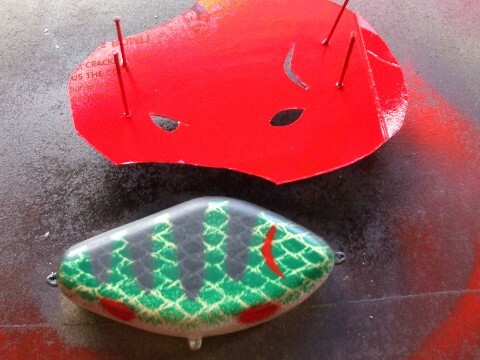 The lures need a coating of some sort to protect the paint job and of course the lure itself. Most lure makers it would seem apply an epoxy resin 'hard coat' to their lures at this stage. The most popular product for this would seem to be an epoxy clear coat called EnviroTex Lite. I fully intended to get some of this to finish off my lures but the fact that I could not find it anywhere locally combined with the fact that work got a bit hectic at the same time meant that my lure making project got abandoned for a while. While in a local hardware supplier I came across a product that grabbed my attention - a type of spray on lacquer for finish coating metal which claimed to have some very hard wearing properties. For the sake of getting my lures finished I grabbed a tin of it and used it to clear coat my lures. It sprayed on nice and even and produced a lovely gloss finish. I knew that it would not be nearly as good as an epoxy finish but would do for now! With the lures now finished there's only one thing left to do - clip on some hooks and take them to the water. For hooks I just took some off other lures I have that I never use - I'll have to look into buying some good quality hooks for my lure making - for now though 'borrowed' hooks will do! The picture above of my finished lures was taken on the river bank just minutes before I made my very first cast with my first ever homemade lures. To find out how I got on, if the lures are any good and if the fish were biting you'll have to wait for a later post here on this blog. Well there it is - my first lure making project complete. I plan to update this post as soon as I can with some video footage of these lures in the water so that you can see what kind of fishing action they have. 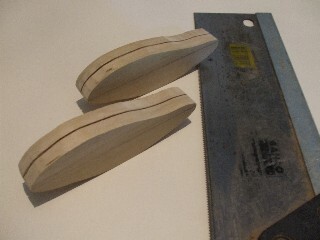 I have already made a start on my second lure making project - a couple of wooden crankbaits made using two free lure templates that I got over at Greg Vinall's website. I'll be writing a post on that project in the near future. 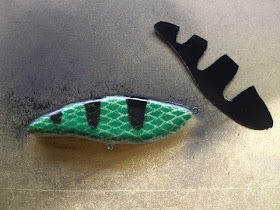 I hope you enjoyed reading through this lure making project, you are welcome to share this post with your fishing friends on facebook or twitter or anywhere else. If you have any questions or comments I'd love to hear from you. Amazing! This is really good work mate! @DavidThanks David. It's actually taking more time to write this blog than make the lures but I reckon I'll stick with it! Nice website by the way, some great deals on lures over there. Fantastic blog! Really informative and inspiring. Good work! J. @AnonymousThanks for your kind comments J. 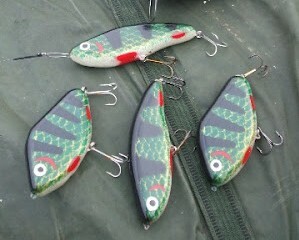 Just finished off some crankbaits this morning so another lure making project post on the way soon! @AnonymousYeah, making lead pellets works quite well - the size of the pellet gives you the exact diameter and depth of the hole you need to drill into your lure to accept the weight. It's a good way for beginners like myself to get the weighting exactly right first time around. I'm sure that with more experience we would be able to judge the correct size of hole to drill and then pour the lead directly into the lure body - time will tell I guess! Glad this post helped. does it matter if the wood used is treated or untreated. @AnonymousDoes it matter if the wood is treated or untreated - good question. By treated wood I assume you mean pressure treated - the type of stuff that is generally used for outdoor work such as timber decking, some types of fencing and sometimes joisting and framing of outdoor buildings(sheds etc). Now I certainly don't claim to be an expert on wooden lure making by any means but my advice to you would be not to use pressure treated wood for your lure making and here's why. During the process of pressure treating, wood is basically impregnated with liquid chemicals which are designed to repel water - this prevents the wood from soaking up water as such which makes it superior for outdoor applications. 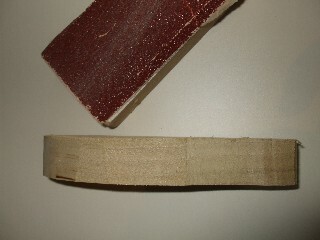 These 'chemicals' that are impregnated into the wood have the effect however of making the wood heavier ie less buoyant. 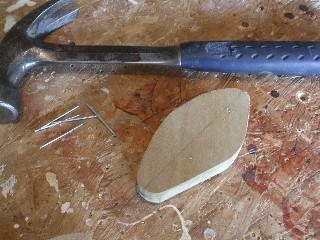 It is this reduced buoyancy that makes the pressure treated wood unsuitable in my opinion for lure making. Also I'm not sure how the chemicals used during pressure treating would react with the sealing coats and paint finishes that would be applied to any lures made from pressure treated wood - this could cause problems. As regards choosing wood for lure making there are lots of different kinds that will do the job well but in general the more buoyant the wood the better. Buoyant woods tend to 'bounce' more in the water. So the more buoyant the wood you use the better the action you will be able to achieve in your homemade lures. I can see the logic in your question though - we are making lures from wood, wood that will be repeatedly cast into water and for long periods of time. The idea with pressure treating is to treat wood that will be exposed to water (rain usually) so that it will resist soaking up the water and hence last longer. The idea with wooden lure making is to completely seal our lures so that the wood within them in fact never comes into contact with water. I hope I've answered your question. If anyone reading here has in fact used pressure treated wood for making lures or has any ideas on the subject I'd love to hear your comments. 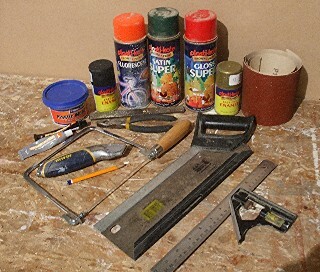 What type and name of sanding sealer did you use? Although there are specific 'sanding sealer' products available for sealing wood I did not actually use one for this lure making project. As such I created my own sanding sealer by thinning down some leftover oil based paint that I had in the workshop. I mixed the paint about 60% paint to 40% white spirits which made the mix very 'thin' and easy to work with. 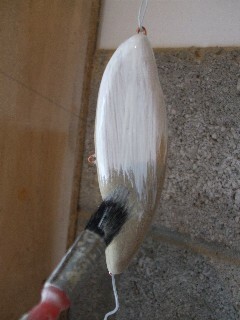 Although I used a brush to apply the first coat I found that dipping the lures gave a much more even coating. The paint itself was a Crown Trade Satinwood paint in a colour called 'cream white'. 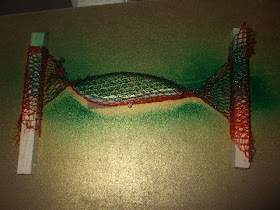 Any oil based paint or varnish (both of which can be thinned down with white spirits) could be used as a sanding sealer and would give a good base for priming and painting the lures with oil based paints or enamels (such as the plasticote aerosol spray paints I used). 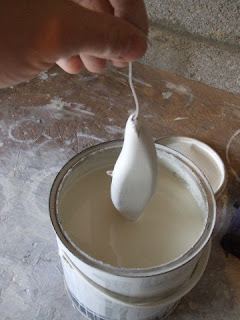 If you intend to paint your lures with acrylic paints which are water based then it would be better to use a water based wood primer or varnish (possibly thinned down with water) as your sanding sealer coat. You can of course go and buy a specific sand and sealer product but if you have some old paint or varnish lying around in the garage it should do the job well enough as long as you thin it down correctly to make it easy to work with. Thin coats of paint/varnish dry more quickly and are easier to sand hence the name 'sanding sealer coat'. What product you use and how many coats you apply will become a personal preference for you. I found that thinned down oil based products and two coats works well for me - some guys I've read use up to six coats to seal their lures. The job of the sanding sealer coat is to seal the lure well enough so that you can put it in water to balance it and also to provide a good base for whatever undercoat you decide to use. So whatever product you use as long as it meets these two requirements then job done! You mentioned that you had problems with using CD case plastic for your diving lips - I,d love to know what your problems were specifically - plastic too thin? Plastic too brittle? Problems glueing it into your baits? I too had some minor problems with using CD cover plastic for the lips on my first crankbaits, mainly due to the brittleness of it. This type of plastic is naturally very brittle so great care needs to be taken when cutting out the diving lips. 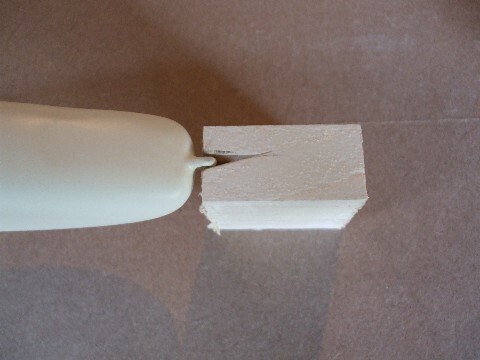 Be careful not to be too forceful with your coping saw or you run the risk of shattering the plastic. You can combat this by clamping the CD box lid to your work surface (bench etc) as close to the cut line as possible without getting in the way of your saw of course. Also use the sharpest saw blade you can (ie new). Unfortunately I have not had a chance to test out the crankbaits I made yet so I can't really comment on whether the CD box lid plastic diving lips are any good in use or not - it may be that their first encounter with a lively pike will be their last, only time will tell! The next crankbaits that I plan to make will be much larger than the first ones and so the CD box plastic as is will be too thin for the much larger diving lips that I will have to make. One thing I plan to try is to glue two pieces of the CD box plastic together using two part epoxy to create a thicker laminated piece of plastic to cut the diving lips from. Not sure how this will work in practice but I'll give it a try and see. Two other materials I plan to try out for lips on future crankbait making projects are metal and believe it or not wood. Wood will only really be practical for larger crankbaits. I can't see why a thin piece of hardwood, probably oak or beech about an eight of an inch thick or less would not work as a crankbait diving lip. For my metal crankbait lips I plan to cut them from paint can lids a few of which I have saved specifically for this purpose. The metal in these lids seems to be reasonably strong without being too heavy which should make them suitable for some smaller crankbaits as well as the bigger ones I plan to make for my pike fishing. I hope these ideas help - do drop back and let me know how you get on. good work ! Hi Joe,come join me fishing on Pulau Sembilan, malaysia. Thanks for your comment - Pulau Semblian does look like a beautiful place to go fishing. If I were going to take a fishing holiday anywhere though I'd be heading for North America or Canada to catch me a Musky! As to the comment about pressure treated wood for lures - DON'T USE IT ! In some cases your sealer will never dry , some cases it will appear to have dried and after a beautiful paint job and perfectly applied top coat it will show it's ugly head. The treated wood as stated is also much heavier which you might think would be a good thing for sinking lures but the lure action becomes sluggish. (if I'm making sense) I can't give the actual reasons but untreated wood weighted has far more action than treated wood of the same weight and profile. My comments are based on allot of research (failed lure making attempts). Enough so,if I heated my house with a wood burner I would be covered this winter. Thanks for stopping by, it's great to hear from lure makers in other parts of the world. It never fails to amaze me how the computer screen in front of me can make the world so much a smaller place. Although I'm an out and out pike fisherman myself at the moment (when I get to go fishing that is) I would hope to put my own glidebaits in front of some Nort American muskys at some stage in the future. I would assume that most of the waters you fish for musky also have some pike in them. Would you use the same baits in the same way for pike and musky or same baits in a different way or different baits altogether? Regarding your comment about pressure treated wood I can see that you come from the same school as myself - the school of 'trial and error'. As I have a background in carpentry and cabinet making my knowledge of woods and how to work with them, how to glue them and how to seal and paint them is fairly good which means that lure making mistakes in this area have not been an issue for me. I have made other mistakes though most of which were recoverable. A bad paint job or top coat can be sanded down and redone. 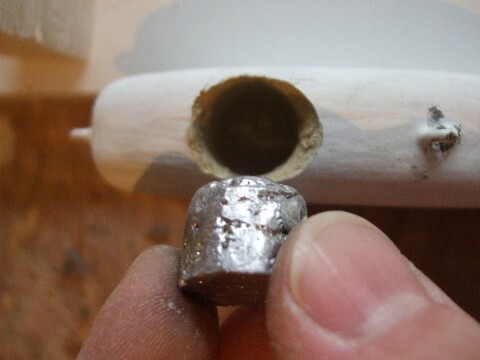 If you add too much or too little lead to your bait you can drill some out or drill a hole and add some more. If you fitted hook eyelets that were too small or too large you can usually change them. If however you get the wood wrong it usually means a bait that swims in the bin! The absolute key to choosing the right wood for your lures is to make sure that it's properly dried out. And I don't mean left on a heater in your home for a few days so that it is completely dry to the touch, I mean wood that has been properly kiln dried at some point and stored in a reasonably dry place afterwards so that it stays fully dry. 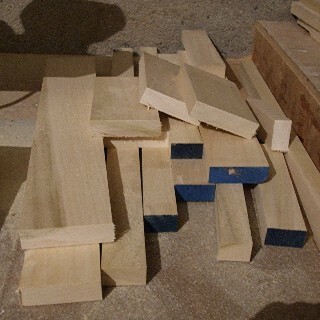 Even heavy hardwoods such as oak and beech can be used for wooden lure making if they are properly kiln dried. The best place to get your wood from would be your local cabinet or furniture maker. If you are lucky they may even give you some offcuts for free. If they wont help you then politely ask them who their supplier is and see if you can order a length of wood for yourself. Again the key to successful wooden luremaking is largely dependent on using wood that is DRY. Hey Joe, As far as pike goes, they are my second choice as far as fish go. When it comes to pike I normally go a size down. In saying that I don't mean a specific down -size like exactly 1" shorter or 1oz. less. Just a lure slightly smaller than I would use for musky in the same overall conditions. ie: brightness,water clarity etc. Color choices are about identical. I'm a more natural color/pattern lure user. Over the past 48+ years I've had more luck with them than say a fire-tiger type lure. I loved seeing you make your own rendition of then Salmo slider. (my absolute favorite store-bought)Guys over here don't seem to realize what a hot little lure the slider is.Great for 'ski,pike ,jumbo walleye. I love the Salmo sweeper too but it is not available over here, Damnit I say,I say !!! Quick question. Does the pike out your way hit at night ? Our's don't. Again I say ,damnit !!! By the way,through trial and error I've came up with a way of pouring lead directly into the lure witout knowing the exact depth of hoke to be drilled. I drill 2 3/8" holes closely together as deep as the centerline of the lure. I take an ice-pick and connect the 2 holes near the bottom of the holes. 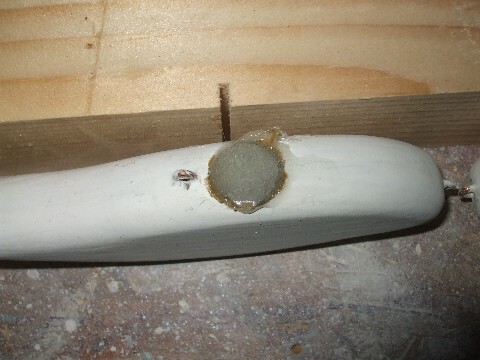 (centerline of lure) I pour melted lead in 1 hole ,the lead runs into the second hole so both holes end up filled the same amount leaving enough space to glue in pieces of wood dowel rod. cut and sand flush. You end up with a lure with the proper weight ,just under the centerline( gives the most shimmey rising and sinking) with all your finishing work being done on wood rather than exposed lead. WORKS GREAT !!! I won't bore you any more. Stay in touch ! Just realized it's 9:15pm over here. Sorry Joe , tried to end a picture of a jumbo walleye caught on a slider but like many of my lure making attempts - FAILURE !! Interesting so see that you use smaller baits for pike. As a matter of interest what would be your standard sized bait for musky fishing. I've settled on baits of about 6 inches in length for most of my pike fishing at the moment, anything smaller draws too much attention from smaller pike (which can be a real pain to unhook) and with larger baits the pike seem to be able to throw the hooks more often than not which makes for some very frustrating fishing at times! I'm glad you like my salmo slider type lures. I plan to post some videos on here eventually to show the different actions of the lures I'm making. The salmo slider copy turned out brilliantly - on a steady straight retrieve (no jerking) the lure comes in with a lovely subtle side to side 'wag', on a steady jerking retrieve (jerk-reel-jerk-reel-jerk-reel type of thing) the lure 'zig-zags' beautifully and on a strong jerk the bait will dart quickly 2 to 3 feet from side to side almost turning back away from you at times. I love your idea for pouring the lead - brilliant - I'll be using that technique on future baits for sure. As regards sending a photo I've set up an email account for stuff related to this blog - you can send it to me at: howtomakefishinglures@hotmail.com. I'll set up a readers photos page or something like that. It would be interesting to have a page here showing different homemade lures from different parts of the world. Are you sure we weren't related in a past life ?For pike,6" is about the max. With musky, the slider is about the minimum.The max I use is maybe 10". (hard lures and not often)Some guys use lures 14". They always say bigger lure,bigger fish. This year my smallest 'ski,32" I caught on a magnum bulldawg, my largest, 50 3/4 I caught on a home-painted slider. Soooooo, you tell me.I guess I should tell you now, my computer skills are extremely limited. I first touched a pc last December and am 100% self taught. Just letting you know up front in case I make any major mistakes. Great idea on the picture thing. Hope I can use it.Bragging only counts when you do it with someone who understands what you are bragging about.I'm starting a new design. looks really cool . I am having trouble with hook placement/weight placement. To make it suspend the way I want forces me to place hooks in a location I don't want.I apologize. I'm old and have a tendency to explain everything in un-needed detail.Sorry.Just had a brain-storm ! Back to work. Stay in touch. HAPPY NEW YEAR !!!!!!!! So you'd say 6 inches as a maximum size lure for pike. I'd say that 6 inches would be the minimum size lure I would be confident in using for my pike fishing at the moment unless of course I'm deliberately targeting the smaller male pike which I would sometimes do in the spring time on the spawning grounds. It seems you record your fish by measuring their length rather than their weight as I would. I must remember to measure the length of my next decent pike for comparison purposes. That 50 3/4 inch musky must have sent you home a happy fisherman that day out! There's loads of different materials that can be used for creating scale patterns on fishing lures. Swimming trunk mesh is a good idea and one I haven't heard before. 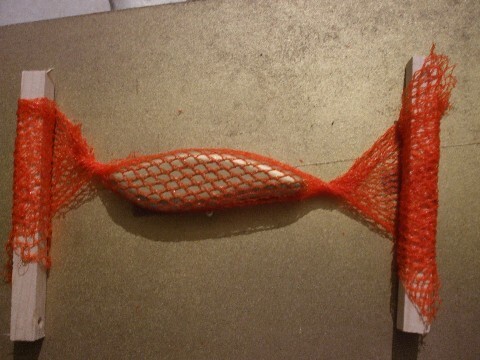 Sewing it together to create a 'sock' of sorts that fits over your lures - again a really good idea. Forgot to address your question about night fishing in your earlier post. Do pike here bite at night, well yes and no. At the moment I'm fishing four different waters local to me, three lakes and a river. 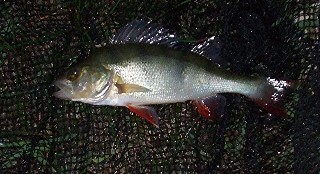 I've tried a bit of night fishing on two of the lakes and on the river. On the river, on the few occasions when I fished all night nothing happened till dawn then had a few fish before going home after it got light. On one of the lakes I have put in a decent amount of effort to try and catch something at night but drew a complete blank, after it gets dark it goes dead and that's it. On the other lake however there are times when the pike won't bite until it gets fully dark, the action usually coming in the first hour of darkness. I have caught pike up to 4 hours after nightfall but to be honest the fishing is still not nearly as good as during the day when the weather conditions are favourable. What you say about bait size makes sense alright. We might have bigger pike on average over here but pike is all we have really. Sure a perch or a brown trout might hit a lure from time to time but they rarely grow big enough in any of the waters that I fish to hold my interest. Two of the waters I fish have in the past produced pike in excess of 35lb although fish of this size are quite rare. 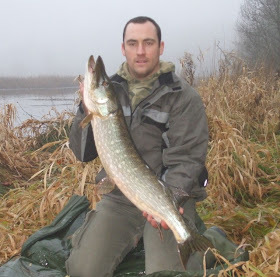 My own best is a modest (but respectable) pike of just over 22lb. Pity about your top coat disaster. I find that I really need to pay attention to my lures (when using e'tex lite) for at least the first hour - after that I can walk away fairly confident that they will turn out ok.
Got one of your pictures alright - it's posted on a Readers Homemade Lures page. Looking at your lovely paint jobs makes we want to go right out and buy an air brush kit for myself but I don't think that I make enough lures to justify the expense just yet! Awesome explanation! many thanks from Buenos Aires, Argentina. @mowie man Hey Mowie Man, thanks for stopping by my blog and of course your kind comments. Well let's see if I can solve your lure painting problems. As for your question 1, here's the deal. Different paints made by different paint companies can sometimes react badly with each other. Sometimes even different coloured paints made by the same company will react with each other. The same is true of paints and resins - some react and some don't. The only way to find out which paints and/or resins react with each other is by trial and error. I have learned this the hard way by having to completely sand down (back to the bare wood) lures that were nearly finished! I now take a scrap of wood, apply some primer and then experiment with any new types of paint that I plan to use on my lures to make sure that there will be no problems. When I come across two paints that react badly with each other then this is what I do - and this will solve your gold paint problem also. I very simply use a clear lacquer between the coats of paint (or paint and resin in your case). So, what you'll need to do is find a clear spray on lacquer or varnish to apply over your gold paint, thus creating a barrier between the gold paint and resin. It sounds to me like your gold paint reacts with solvents though so I'd suggest getting some clear water-based varnish and dipping your gold painted lure into that (thin it down a little first though). Experiment on a scrap of wood first - spray on some gold paint, apply some water based varnish and then cover with your resin (leaving the correct time between coats to dry of course) and that should do the trick. As for your question 2 it sounds like you are not getting the mix of resin and hardener right. I have of course made this same mistake myself a number of times ending up with lures covered in tacky resin that just wont cure. The only solution unfortunately is to scrape/sand the whole lure back and start painting all over again. You really need to be accurate when mixing your resin and hardener and you have to be sure that you mix the two together fully (I mix mine continually for at least two minutes with a flat sided stirring stick to make sure I get all the stuff out of the bottom corners of the little medicine tubs I use). I actually set a timer for myself so I know for sure I have been mixing for at least two minutes. Working with resin is probably one of the most tricky parts of the lure making process to learn. It is well worth the effort though, your homemade lures really look well with a clear glossy epoxy hardcoat on them! Well Mowie Man I hope these few pointers help solve your lure making problems. Been thinking for awhile as to how to go about making a lure out of wood, yours look good. Will attempt to make one over the next week or so and see what happens. Hey Eddy, thanks for stopping by my blog. The few lures I made (detailed in the post above) did turn out quite well in the end. At this stage they have actually caught me quite a lot of fish. I wish you the best of luck with your first go at lure making. Be sure to let me know how you get on - I'd love to see some pics. Your step-by-step instructions on lure making is so precise. I am impressed with your method of design and with the materials you use. How resourceful to use copper wire for the "bridle" to hold the hardware. I like to whittle, carve wood and fish. 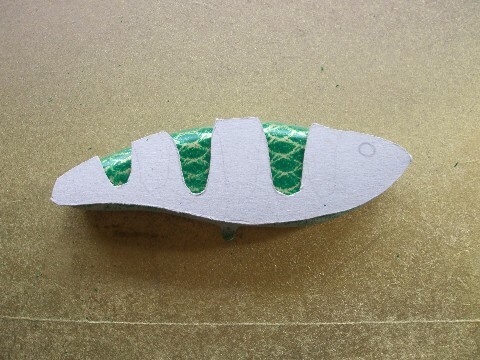 After reading your blog post, it won't satisfy me to simply carve a lure. Now I want to carry the project to completion. And your blog is totally inspiring. Thank you. @Melissa B Hey Melissa, I'm glad you enjoyed reading my blog. It's a pity I don't have the time to update it as often as I'd like but I will update it from time to time so do check back again later! Awesome blog. It is very informative and inspiring post, i really like your post. Thanks for sharing this wonderful post with us. Great stuff; nicely written and very informativ; hope it will inspire me and finally gets me going ,,,Thank you Joe ! I really enjoyed this pictorial on how you make your lures. I do have a suggestion that would make adding the weight a lot easier. I used your method to locate the positions of the weights needed for my lure. However, I simply weighed the eggs sinkers I used on each position. I used a very accurate scale that I use for reloading. Anyway, the weights I determined were 90 grains up front, and 85 grains in the back. I measured out 90 and 85 grains of lead shot - used for shotshell reloading. 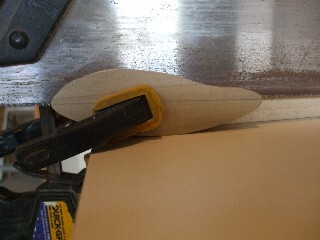 Then I drilled the lure wooden lure body with a 3/8" bit - this is real important. A 3/8" bit is the same size a common plug cutter bit. 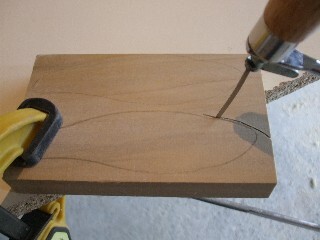 I also determined the depth to drill from a scrap of wood. After some trial and error, you can determine a good depth that would also allow room for a plug to fill the last bit of the drilled hole. I wish I could have added the pictures I took, but I hope this explanation helps with your next lure making project. As a keen fisherman since the age of about ten years I have a huge interest in fishing and all things fishing related. Although I will fish for any kind of fish in any water whenever opportunity presents itself I have in recent years concentrated my efforts on only one species - Pike. I am a Pike Angler, in lake, river or pond on lure or bait I just love to catch Pike!